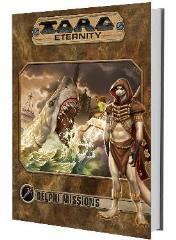 Delphi Missions: The Living Land is the second in a series of adventures set in The Living Lands. Bound in the finest European style binding these eleven adventures will provide players with many sessions of game play. Played as a running campaign or as a single adventure dropped in the middle of an ongoing story. These dangerous missions add opportunities and complications to the Storm Knight’s lives and help flesh out the dangerous Living Land!